Brushless DC motor displays its advantages in the speed regulation field because of its characteristics of wide speed regulation range, small size, high efficiency and stable revolving speed, small errors and so on. In a word, brushless DC motor is a kind of mechanical and electrical product with small size but strong power. ATO markets high torque BLDC motor, high speed BLDC motor and BLDC motor controller of different models. And 11000rpm 12V/24V high speed BLDC motor is a new upgrade product,the detailed specification parameters are as follows. The permanent magnet of brushless DC motor currently adopts the Nd-Fe-B material of high magnetic energy product. Therefore, the size of brushless DC motor is smaller than the motor of the same capacity. With the same capacity, brushless DC motor is one frame number smaller than the three-phase asynchronous motor. Despite of the small size of brushless DC motor, it has the advantages incomparable by other motor categories. ATO will show a high performance and 9000 rpm high speed brushless DC motor with small size, which is widely used in many applications. Nowadays, people have higher requirements to the hair drier. Water ions have the function of protecting hair, the hair dryer treats water molecules in air to ultrafine particles and improve the water content to 1000 times, so as to keep hair fresh and moist all the time, eliminate the dandruff thoroughly. Then what motor does the hair dries adopt? 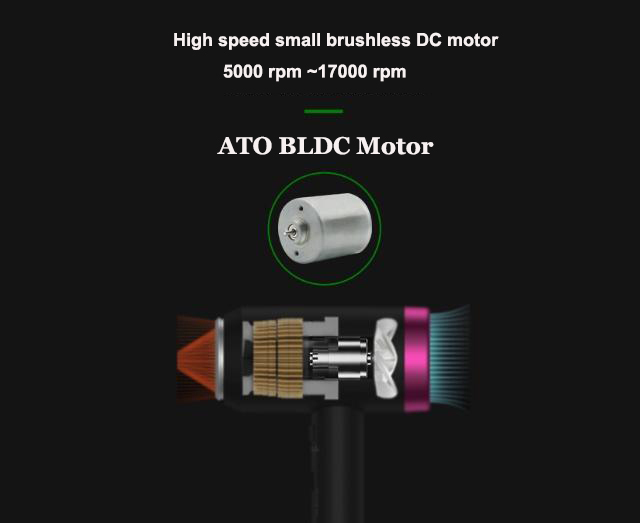 ATO recommends the high speed brushless DC motor. Motor is undoubtedly the heart of the intelligent household sweeper, the quality of the motor to a considerable extent affects the operation of the intelligent sweeper. Compared with the floor sweeper of carbon brush motor, the friction force of the floor sweeper of high speed small brushless DC motor with stable performance is greatly reduced in operation, and the loss of the machine is also reduced correspondingly. Without friction, the noise is also reduced, the operation is smooth, and the service life is up to 5 times of the ordinary sweeper. Because of the high efficiency and low heat output of brushless DC motors, it is very suitable for industrial machinery and air conditioning refrigeration mainframe, fan and water pump, air compressor load and other industries running continuously in 24 hours. The characteristics of high torque in low speed period and high frequency of positive and negative rotation without heating are more suitable for driving machine tools and traction motors. Its stable speed accuracy is higher than that of DC brushed motors, higher than that of vector control or direct torque control speed closed-loop variable frequency drive, and better performance-price ratio, which is the best choice of modern speed control drive. According to statistics, high starting torque, large torque, low inertia ac brushed motor, brushless dc motor, stepper motor, DC servo motor have been widely used in industrial robots. Most industrial robots with a general load of less than 1000N (equivalent to 100 kg.f) adopt dc motor drive system. The joint driving motor used in robot joint mainly includes BLDC motor, stepper motor and DC servo motor. Stepper motor drive system is mostly applicable to the precision, speed requirements of small simple robot open loop system, brushless DC motor because of the use of commutation, no commutation spark, in the flammable and explosive environment has been widely used. The power range of robot joint drive motor is generally 0.01 ~ 10kW.